Tréaslaímid le Lexie Ní Chuilinn Nic Shuirtáin agus le Orlaith Ní Cheannuain beirt daltaí ó Rang 5 a bhuaigh duaiseanna i gcomórtas ealaíne an Chomhair Chreidmheasa. Bhain Lexie an chéad áit amach san aois ghrúpa 8 – 10 mbliana d’aois. D’aimsigh Orlaith an tríú hait san aois ghrúpa 11-13. Huge congratulations to Lexie and Orlaith, Rang 5, in their fabulous achievements in the Credit Union Art Competition. Lexie secured 1st place in the 8 – 10 year old category, while Orlaith received 3rd place in the 11-13 year old group. 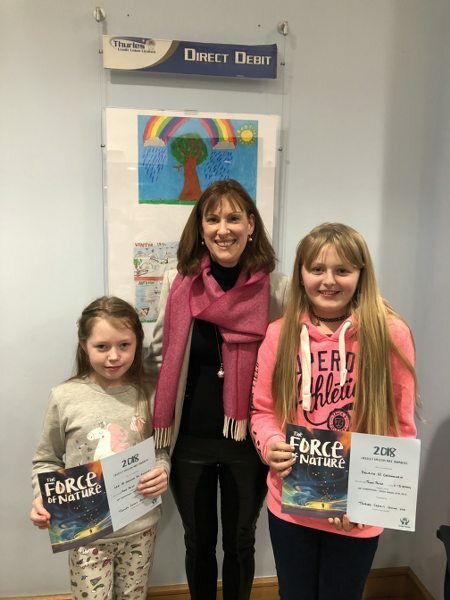 Their fabulous work can be viewed in Thurles Credit Union.